The most recent issue of Zymurgy reminded me how much I enjoy this magazine. In this post I give a brief over view of the current issue and how I learned about the monthly magazine Zymurgy. Its a practical magazine with good solid helpful hints. This month is a prime example. They feature homebuilt brew tools. The projects include making a wort chiller, yeast stirplate, walk-in cooler, bottle filler, small kegging system, carboy drier, sanitizer/storage box for long items and carbonation cap. Some are very involved projects. Others like the carboy drier are much easier and could prove to be useful right away. Each issue contains articles submitted by familiar beer industry writers. This month Stan Hieronymous author of Brew Like a Monk and Appelation Beer gave an account of the Pro-Am competition at the GABF. Charlie Papazian, president of the Brewers Association, also has something to say. He speaks to beer style guidelines and their relevance to homebrewers and professional brewers. 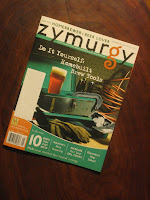 If you want a grass roots, straight shooting beer brewing magazine check out Zymurgy.